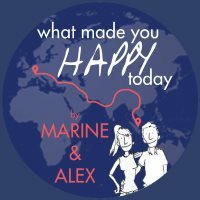 Kashgar – November 21st to 23rd 2016 – What Made You Happy Today? Arriving at night in Kashgar, we experienced our first snowflakes. 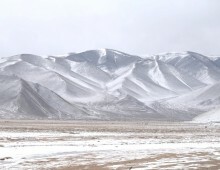 We would learn that it is not normal to have snow in Kashgar and that it started to snow the day before our arrival! 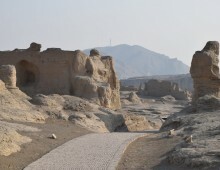 Anyway Kashgar was much more appealing than Turpan for us. 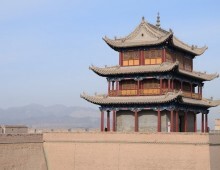 The old city was bigger, even if the Chinese government destroys it to the name of seismic safety (what a shame). Only a part of the old city looked very empty and we wondered if people still lived there or if it was because of the very cold weather that we could not see anyone when wandering around. We totally felt that we were not in China anymore but in a country in Central Asia. People did not look like Chinese people but more like us. The architecture looked like being extracted from the magnificent book of the One Thousand and One Arabian Nights. We hard a hard time finding a good guesthouse, at the end we do recommend Kashgar Old Town Youth Hostel. The market was lively. The people were wearing toques and fur coats. We also tried our first Ouighour food at Altun Orda restaurant: polo (rice with sultanas and spices), juicy mutton kebabs, pumpkin dumplings, and a saffron tea that we will remember for a long time because it was the best tea we ever tasted. 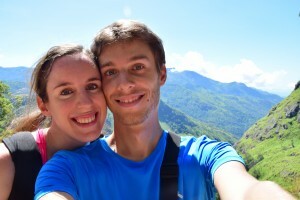 At the very West of China, our objective as you may guess was to carry onto the Silk Road back to France! So will you guess our next destination? It’s complicated! Local ethnies speak ouigur or tadjik or some other regional dialects. They don’t speak Chinese, apparently they don’t want to learn as a way of protesting against the Chinese colonization. And of course all the Han Chinese that emigrated here speak Chinese. So you can imagine how lost we were in the middle! Are people happy there though?